Automotive students in teacher Jordie Lehr’s classes at Grossmont High School were treated to a fun experience as part of Career Technical Education (CTE) Month. 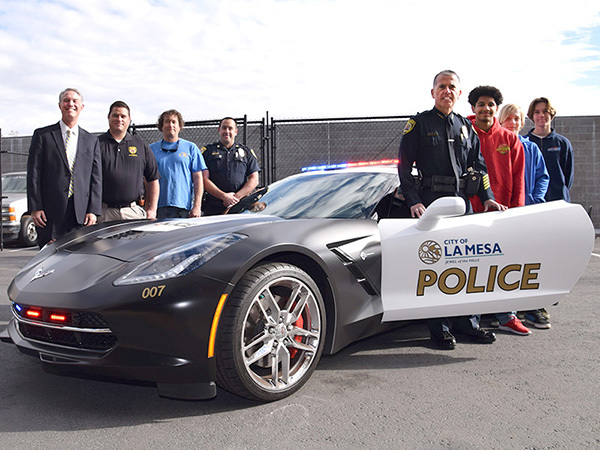 On Wednesday, Feb. 21, La Mesa Police Chief Walt Vasquez, Captain Matt Nicholass, and Officer Dan Paugh brought the La Mesa Police Department’s 2016 Chevrolet Corvette Stingray C7 onto campus for the day. Police officials shared their mutual interest in vehicles with the automotive students who reviewed the specs of the La Mesa PD Corvette that is equipped with a LT1 6.2 liter V8, 376 cubic inch, 455 horsepower engine. The La Mesa PD corvette is a partnership between Bob Stall Chevrolet and La Mesa PD. Bob Stall loaned La Mesa PD the vehicle and permitted them to outfit it as a promotional police vehicle that could be used at special events in the community. Not used for enforcement purposes, the corvette was outfitted entirely by donations from within the region, and no tax dollars were spent on the project. “We thank Chief Vasquez and our friends at the La Mesa Police Department for taking the time to talk with our students who are developing the technical skills and expertise to work on vehicles in preparation for entering the industry of vehicle maintenance and repair,” said Superintendent Tim Glover. The Grossmont High School Automotive Pathway offers a high tech, industry current facility for students to learn skills in the Automotive Industry. The pathway is a sequenced pathway where students learn Automotive Technology, Auto Suspension, Steering, and Brakes, as well as Auto Engine performance and Emission Control. Daniel Paugh is a racist and sadistic cop. He needs to be fired from the La Mess Police Department before he kills an innocent person. That is, if he hasn’t done it already.